NE-Stuff: KEP's T2 .21 - Prestentation! 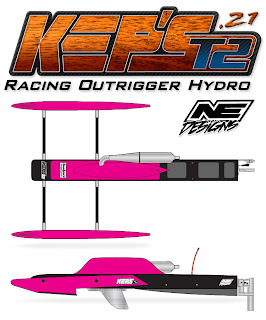 This is the story behind the KEP's T2 .21 - R/C Racing Nitro Outrigger Hydroplane 3.5 cc boat. Read this presentation first and then go HERE and download of the Freebie PDF's. Finally I'm done with the new "Freebie" template drawings of my latest .21 sized outrigger hydro project. I hope you like it and I look forward to seing plenty of T2's being built! A basic comparison of the old KEP's .21 freebie and the new KEP's T2 .21 freebie. 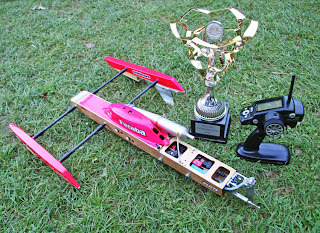 This is my T2 prototype I finished second with at the NAVIGA 2012 FSR-H3.5 World Champions ships final in Dessau. Note, that boat is slightly different to the Freebie. 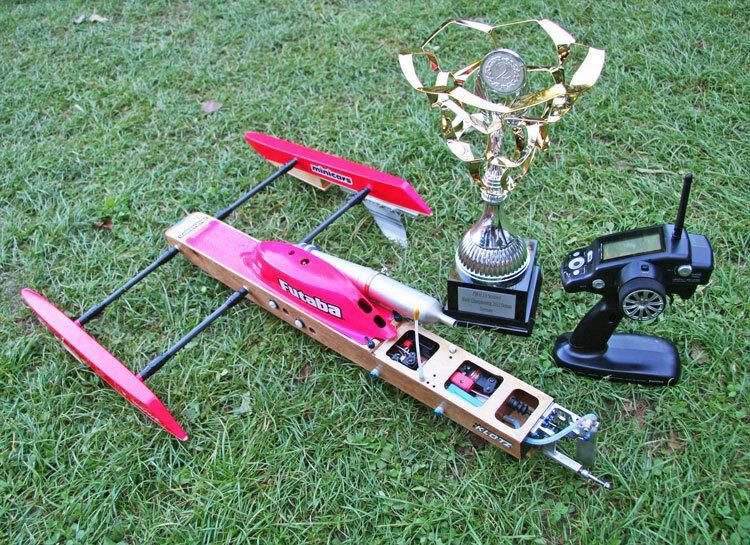 Run good in the race conditions we race our boats in (NAVIGA style). Be faster and run lighter then our old riggers. Be adjustable in a different way and easy to wrench. Symmetrical elliptic-shaped sponsons (viewed from top). Make the design tight and not waste space. More pics of the T2 project. This is one of the T2 prototypes we built. Note multiple engine placement holes, 2 mm inside reinforcements where the engine is - due to the too-soft 4mm gaboon plywood being used in the prototypes and notched/stepped tub-deck. Neither is included in the production T2 freebie. Production T2 resting nicely in the drink. Ride-pad AoA - we have decreased it from well over 4 deg to around 4 deg or slightly below. 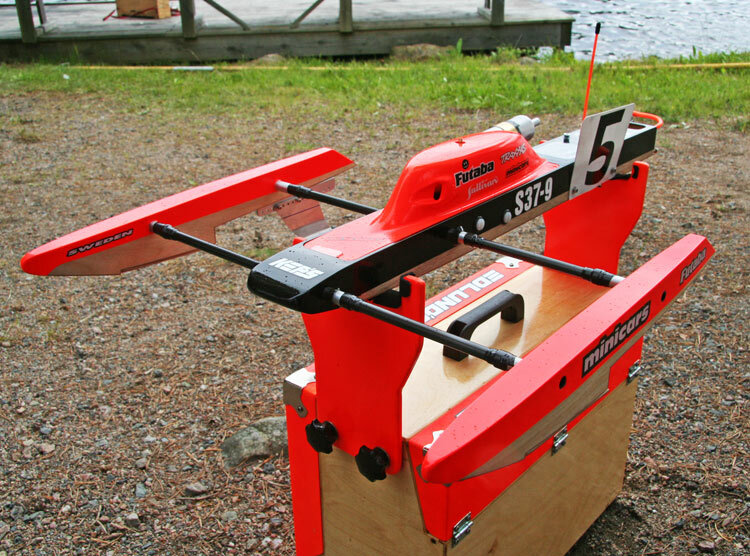 The T2 is designed to be raced in all race conditions. If you are only/mainly driving by yourself in smooth conditions you could add some AoA with the removable ride-pads. Ride-pad shapes - we have gone away from using different steps and widths etc. Flat pads is what works best on this boat for racing together with other riggers in race waters. Ski-ramp height - it likes the rear to be a little higher vs the front so to speak. As in the complete boat is in theory angled a little forward - at least stationary. 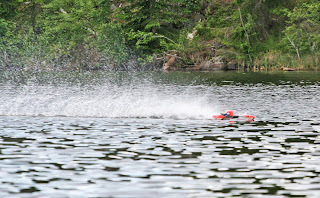 In race water the ski penetrates the water more then the sponsons though so the total boat AoA is about "level" anyways. 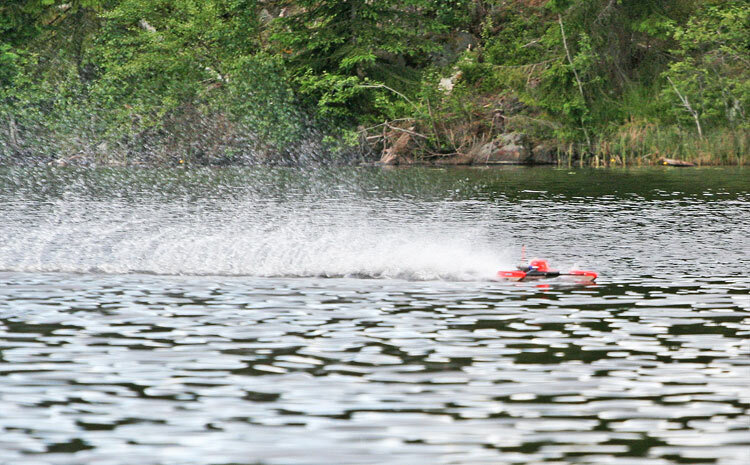 Micke's Production T2 in action in Ludvika 2012. Especially when you crash or hit a buoy it takes just a few minutes to change a pair of carbon tubes and these don't need to be drilled etc. Here you can also see the removable ride-pads on the sponsons. 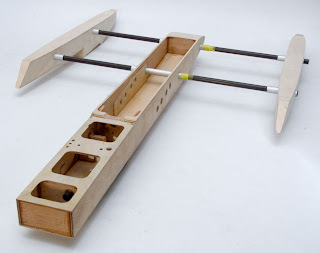 You can make ride-pads with different thickness (that alters the complete boat's AoA) or wedged to change the AoA of the ride surfaces... That's the same with the rear ski-ramp - it's removable so you can modify it to alter the boats AoA etc. Ski-ramp width - 25 or 30 mm - we haven't really noticed any difference but I would choose to make it 30 mm wide! Ski-ramp AoA & shape - not really critical on the T2. I have mostly used a fairly curved shape that is only flat the last 50 mm. Mikael have used more AoA and longer-flatter surfaces but no major differences between them... 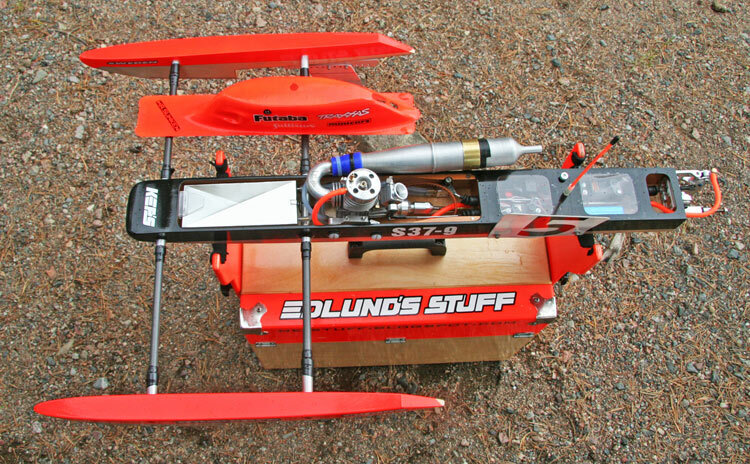 Build the one that is included and don't glue it to the boat. Make it removable as intended so you can change it etc. After-plane length - We have used from 525 up to 575+ mm and all of them works good in the race conditions we have used them in for 2 years. The 525mm length I have settled with in the Freebie is a good start (and very close to the old KEP's 2010 also as it happens). 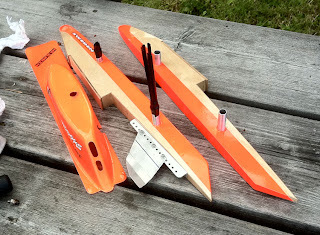 You could build it longer (sponson moved forward) but the boat will get lighter and lighter on the front sponsons (the more you move them forward) as in harder to get them to stay on the race-water... So build it to the 525mm spec! 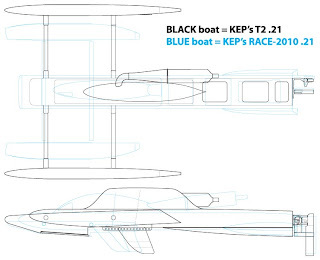 Top-view production KEP's T2 .21 - this one has a NR 5P engine. Tub length: 678mm / 29.7"
Overall length (transom to tip of sponsons): 740mm / 29.13"
After-plane length: 525mm / 20.67"
Tub width: Outside: 70mm / 2.76" - Inside: 62mm / 2.44"
Sponson widths: 28mm / 1.1"
Ride-pad widths: 30mm / 1.18"
Ski width: 30mm / 1.18"
Track width (outside-outside & no-offset): 450-475mm / 17.7-18.7"
Weight distribution (if put on 3-scales and built with the specified hardware): front sponsons: about 500g /1.1lb each and 650g/1.43lb on the rudder. Speeds: The T2 .21 has for sure potential to reach 120kmh/75mph (and beyond) but as most of you that race these riggers know - heat-racing in those kinds of speeds are far from easy - and can mostly be done only in optimal conditions and with few boats on the water. To my experience that is very seldom the case as the water most of the time gets too rough for going over lets say 100-105kmh /60-62mph. Props we have used are mostly made by Mark Sholund. Mostly ABC H6's and 50x69's with 3.2-3.3" cup. The latest props from Mark have used a pitched up C.O.B. (the complete blade has more pitch) also and that feels really good. But the T2 will perform surprisingly well also with an old-school Octura 1445 with moderate cup as it likes to be tuned towards RPM and not torque. I have had it up to 120+ kmh with only 3.2 cup! Production KEP's T2 .21 - front left view. 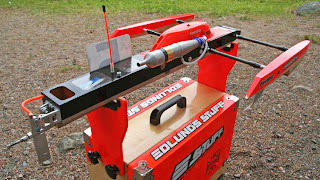 Do-It-Yourself design by Niklas Edlund & R&D'ed by Mikael Sundgren & Niklas Edlund in 2011-2012. Template drawings are complete with drawn-in hardware so you know where the stuff should be located - no need to guess! True 3-point rigger design principle! Fast in race water & very good balance in rough water! 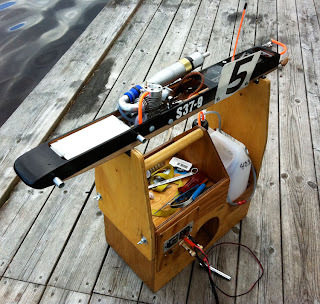 The steering is super-effective (as in very small rudder throws is needed)! Symmetrical shaped front sponsons (not true symmetrical though as there is still a left and a right hand version of course)! Straight through the hull stuffing-tube and J-bend flex tube for optimal ease of build and low friction! Production KEP's T2 .21 - left side view. Even though the T2-21 is now ready to be shared with you all - it's still an ongoing development. I'll try and publish updates when we test some new things on it. Next season (summer of 2013) is the first one for me to race the true "production" T2 rigger myself as so far I have only race the prototypes. 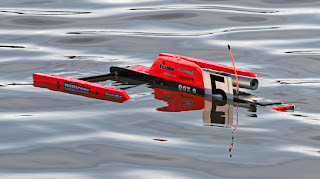 But "Sunken" has raced his Production T2 and it feels and looks as good as our T2 prototypes! Build it to the specified specs and I'll hope you like it! Production KEP's T2 .21 - left rear view. Don't build the sponsons with flat sides like a "JAE 21G2". If you aren't willing to build it to the specs then I would strongly suggest you to build a JAE 21G2 instead. 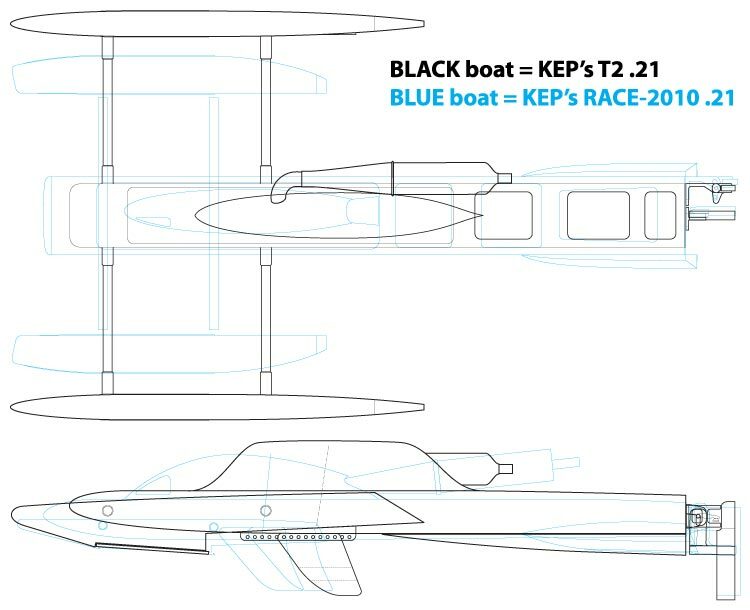 That boats is meant to use that design of sponsons -> the T2 isn't. And a JAE 21G2 is slightly easier to build also (I think - I have never built one). We have never used a rear-exhaust engine (like a Valvola) in any of our T2's so we don't know how the boat performs with that type. If you do intend to use that style of engine - please let me know how that works for you as I have no clue! Production KEP's T2 .21 - right rear view. Front exhaust .21 engine with 180 deg Novarossi manifold & Zoom 21 carb with 15 mm neck dia. 3:rd channel remote needle. We have used the O.S. remote needle together with either the Ferrette needle base or the new VictoSport base that is the one illustrated in the drawings. 2 pcs of 40x70x500 mm (1.58x2.76x19") blocks of Divinycell H60 (or an equivalent cross-linked structural PVC foam like Airex C70.55) - you can make it up by using 10/20 mm sheets also as it's easy to glue them together with either CA or PU glue. This is a key item for a success T2 build - find a source for it or wait with the build until you have found it... Trust me. Futaba S3150 servo (or the brand new Futaba S3172SV - High Voltage & S.BUS - same size and price as S3150!) for throttle and 3:rd channel (or equivalent that are exactly the same dimension or smaller). See the PDFs with the important servo dimensions for reference. 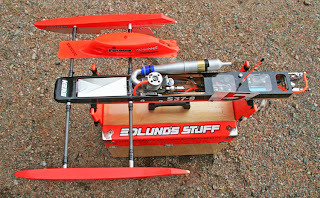 Futaba S9551 or Futaba BLS551 steering servo (or equivalent that are exactly the same dimensions or smaller). 1.5-1.6 mm thick 7075-T6 aluminum sheet for the turn-fin. 2x15x16 mm L-bend 90° aluminum angle stock. Turn fin mount. 1/4" / 6 mm diameter aluminum solid rod to make 3 pcs of 15 mm long turn-fin epoxy-glue-in sponson fasteners. Inside thread: 4-40 or M3. Hardware: Light weight .21 strut / .21 light weight rudder / .21 engine mounts with McMaster-Carr #9307K38 rubber grommets and 1" long 1/4-20" nylon bolts. Vapex 2S/6.6V 1000 mAh LiFe receiver battery. 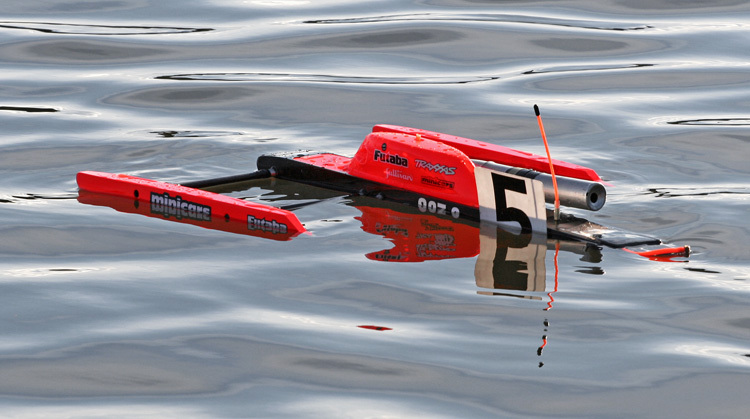 Frank Werner (Germany) push-rod seals (3) (can be bought in the US from Wood RC Boat Racing). 10x8 mm carbon or aluminum tube to mount the push rod seals on (a 40 mm long tube will be enough). Futaba 2.4GHz radio - I'm using the T4PL with R2104GF receiver. Octura #OCFH1414 - 1/4-28" flex collet. Octura #OC6DM - 3/16" small dia drive dog. Hughey 18" long .187" / 3/16" flex shaft with 3-1/8" hardened stub shaft. Flex bushing 3/16" collar type. Short pieces of velcro with self-adhesive backing for mounting the receiver battery and receiver. Sponson tubes of your choice. We use 10x8 mm pultruded carbon ones but if you are happy with some other material or dimensions - feel free to use that! Aluminum sponson tubes for tub and sponsons. Matching dimensions that slips on the outside of your preferred sponson tubes without too much slop. We use 12x10 mm of an anodized std aluminum tube we buy at the hardware store. 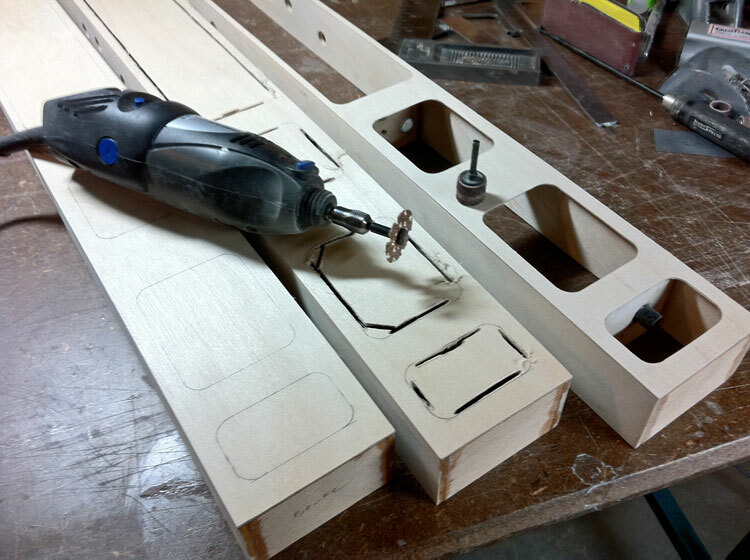 If you chose to alter the dimensions - drill the holes to a diameter that matches them. Wood spiral brad-point drill bits like: Bosch 11 mm #2609255208 & 12 mm #2609255209. Cowl - we are working on that - it might be available later this winter... Maybe. Scrap pieces of 0.7-0.8 mm polycarbonate sheets (Lexan) to make the front cowl mount. Tank material of your choice. I use K&S 0.2 mm tin sheet I have bought on a roll. K&S std 1/8" brass tube for making the tank & the cooling tube through the radio box. 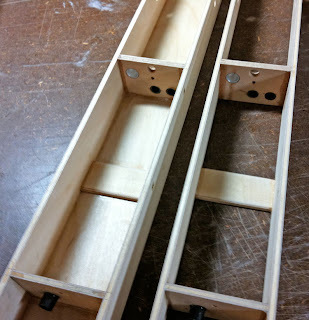 In total 2 ft / 600 mm is needed in total if you make your own tank. K&S 1/4" brass tube for the flex (about 360 mm long is needed). K&S 9/32" stuffing tube (about 115 mm long is needed). A 20 mm short piece of brass tube that fits snuggly over your preferred choice of antenna tube. 1 pcs Du-Bro #367 - Ball end for carb. 2 pcs Du-Bro #369 - Ball end for steering rod. 1 pcs Du-Bro 4-40 threaded rod (#802 is 6pcs). 1 pcs Du-Bro #336 - 4-40 threaded solder coupler for steering rod (2 in a bag). 2 pcs Du-Bro 2-56 threaded rod for throttle linkage and 3:rd channel (#801 is 6pcs). 6 pcs Du-Bro #893 servo mounting screws for throttle and 3:rd channel servos plus the receiver switch holder (24 in a bag). 4 pcs Du-Bro #382 servo mounting screws for steering servo (8 in a bag). 0.6-1 mm carbon sheet for two transom doublers (inside and outside). 1 mm thick scrap piece of fiberglass sheet for making the receiver switch holder plate and suggested pipe-mount base (1.5 or 2 mm scrap piece is needed for the pipe-mount). K&S #240 brass strip (0.8x6.4x305 mm). DIY pipe-mount clamp. 2 pcs of D4xL2 mm neodymium magnets - cowl fasteners for gluing in the cowl. 2 pcs of D4x4 mm neodymium magnets - cowl fasteners for gluing in the rear cowl rests. For those of you racing with NAVIGA rules: 2 pcs of threaded brass inserts with either M4 or 8-32 threads. We use Du-Bro #393 (8-32). 100x700 mm tub-sides laminates: 1+2+1 mm thick. Aircraft birch plywood on each side of a 2 mm Abachi or balsa core. 1 mm Birch Aircraft plywood (tub deck & sponsons etc). 1.5 x 75 x 700 mm Birch Aircraft plywood - preferably cross grained for tub bottom. 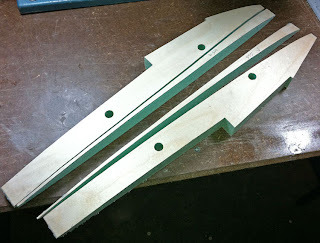 1.5 mm Birch Aircraft plywood - for ski-ramp bottom, stuffing tube cover & sponsons. 2-2.5-3 mm Aircraft plywood for making different ride pads. 4 mm Birch Aircraft plywood (for 3 bulkheads). 6 mm Birch Aircraft plywood (for transom & one bulkhead). 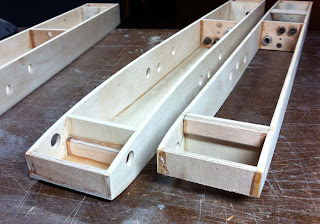 2 mm Light plywood - scrap pieces for making deck doublers. 6 mm scrap pieces of plywood for making the rear cowl-rests, receiver switch mount and servo mounts. That doesn't need to be aircraft birch plywwod - I have used ocoumé/gaboon. 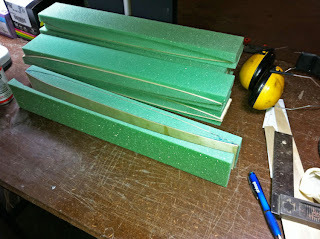 Nose-block material for tub and sponsons. That can easily be glued together thicker birch plywood scrap pieces. PU wood glue (Polyurethane - like Gorilla Glue in the US) for laminating the tub-side sheets. I don't recommend using any kind of epoxy or std wood glue for the tub-side lamination. Note, I earlier recommended to use Titebond-III Ultimate wood glue but not any more. Even though you get a good wood joint with that - it's booth heavier and the laminate will be "softer" then compared to a PU glued laminate. ZAP-A-GAP Medium CA (green label) glue in either 28 g or 56 g bottles - you will need in total about 6-8 bottles of #PT-02 (28gr) or 3 bottles of PT-01 (56 gr). 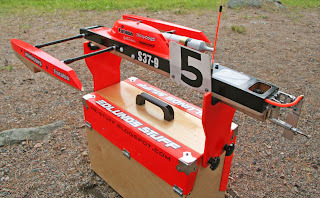 Great Planes #MR6034 - CA kicker or equivalent brand. Epoxy glue - 5 & 30 minute. 25g light-weight thin fiberglass cloth to reinforce the engine/tank compartment corners and to cover the stuffing tube inside the radio-box. R&G Poxy-Systems epoxy resin C + Hardener C. Chemical resistant laminating epoxy. The best one by far we have tested to date for using when reinforcing the tub corners with cloth and also impregnating the complete boat. Simply awesome! A roll of self-adhesive plastic/vinyl "book-cover" sheets. To be used as the radio-box "lid". A roll of thin double sided "super" tape for mounting the ride pads and the rear ski-ramp. I have used a transparent film tape from Stokvis that is 12 mm wide and 0.7 mm thick. The only drawback with that one is that it sticks like crazy... In Scandinavia you can buy it here. A roll of electrical vinyl tape. We have used what ever we can find but you may want to try this one: 3M/Scotch Super 33+ Vinyl Electrical Tape. That seems to have very good tech-specs! The T2-21 build-series starts HERE.